Are You Under Part 46 or Part 48? There are two types of training requirements in 30 CFR, Part 46 and Part 48. • Part 48 covers all underground mines, surface coal mines, and some surface metal/nonmetal mines. • Part 46 on the other hand covers very specific types of mines. NOTE: If you are a contractor at a Part 46 mine you may also be under Part 48. • Work in an underground mine or work in shaft or slope construction, or are regularly exposed to mine hazards or work in maintenance or service either employed by management or work for a contractor at the mine for frequent or extended periods. NOTE: This includes management if they work underground on a continuing, even if irregular, basis. • In lieu of subsequent training under that section for each new employment, receive hazard training under 30 CFR 48.11. • a maintenance or service worker, working on mining equipment for frequent (a pattern of recurring exposure) or extended periods (more than five consecutive work days); or ?? 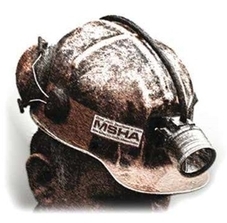 • a construction worker who is exposed to hazards of mining operations for frequent	or extended periods. The production-operator is primarily responsible for providing you this training. It must be given before you start work at each mine site. • or miners (such as drillers or blasters) who move from one mine to another while remaining employed by the same independent contractor.